barrel: the main body area of the horse, enclosing the rib cage and the major internal organs. cannon or cannon bone: The area between the knee or hock and the fetlock joint, sometimes called the “shin” of the horse, though technically it is the metacarpal III. chin groove: the part of the horse’s head behind the lower lip and chin. (the area that dips down slightly on the lower jaw). Area where the curb chain of certain bits is fastened. coronet or coronary band: The ring of soft tissue just above the horny hoof that blends into the skin of the leg. crest: the upper portion of the neck where the mane grows. elbow: The joint of the front leg at the point where the belly of the horse meets the leg. Homologous to the elbow in humans. fetlock: Sometimes called the “ankle” of the horse, though it is not the same skeletal structure as an ankle in humans. Known to anatomists as the metacarpophalangeal (front) or metatarsophalangeal (hind) joint; homologous to the “ball” of the foot or the metacarpophalangeal joints of the fingers in humans. flank: Where the hind legs and the barrel of the horse meet, specifically the area right behind the rib cage and in front of the stifle joint. forearm: the area of the front leg between the knee and elbow. Consists of the fused radius and ulna, and all the tissue around these bones. Anatomically the antebrachium. forelock: the continuation of the mane, which hangs from between the ears down onto the forehead of the horse. frog: the highly elastic wedge-shaped mass on the underside of the hoof, which normally makes contact with the ground every stride, supports both the locomotion and circulation of the horse. gaskin: the large muscle on the hind leg, just above the hock, below the stifle. Homologous to the calf of a human. 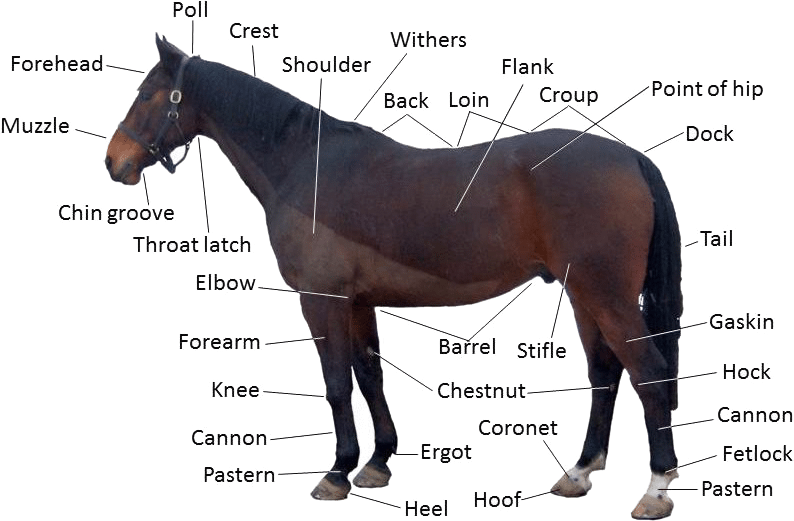 girth’ or heartgirth: the area right behind the elbow of the horse, where the girth of the saddle would go, this area should be where the barrel is at its greatest diameter in a properly-conditioned horse that is not pregnant or obese. hindquarters: the large, muscular area of the hind legs, above the stifle and behind the barrel of the horse. hock: The tarsus of the horse (hindlimb equivalent to the human ankle and heel), the large joint on the hind leg. hoof: The foot of the horse. The hoof wall is the tough outside covering of the hoof that comes into contact with the ground. The hoof wall is, in many respects, a much larger and stronger version of the human fingernail. jugular groove: the line of indentation on the lower portion of the neck, can be seen from either side, just above the windpipe. Beneath this area run the jugular vein, the carotid artery and part of the sympathetic trunk. loin: the area right behind the saddle, going from the last rib of the horse to the croup. Anatomically approximate to the lumbar spine. mane: long and relatively coarse hair growing from the dorsal ridge of the neck, lying on either the left or right side of the neck). muzzle: the chin, mouth, and nostrils of the horse’s face. splints: bones found on each of the legs, on either side of the cannon bone (8 total). Partially vestigial, these bones support the corresponding carpal bones in the forelimb, and the corresponding tarsal bones in the hindlimb. Anatomically referred to as Metacarpal/Metatarsal II (on the medial aspect (inside)) and IV (on the lateral aspect (outside)). shoulder: made up of the scapula and associated muscles. Runs from the withers to the point of shoulder (the joint at the front of the chest, i.e. the glenoid). The angle of the shoulder has a great affect on the horse’s movement and jumping ability, and is an important aspect of equine conformation. stifle: Corresponds to the knee of a human, consists of the articulation between femur and tibia, as well as the articulation between patella and femur. throatlatch: The point at which the windpipe meets the head at the underside of the jaw.